Based on the vulnerability report from Dave we developed micropatches for heap buffer overflow CVE-2017-17969 and insufficient exception handling CVE-2018-5996 in 7-Zip version 16.04. By diffing source code of the patched version 18.00 and the vulnerable version 16.04 we found the following changes related to CVE-2017-17969 (highlighted lines mark patched code). jne skip1  ;cur != kEmpty? jb skip2  ;i < kNumItems? je block        ; cur == kEmpty? jge block       ; i >= kNumItems? When developing a micropatch for this vulnerability, we had to patch the CDecoder class that had to be extended by a new member - the _errorMode variable. This was the first time we attempted something like that with 0patch. So we either had to make room for the new variable (increase the allocated object memory block) or find existing unused space within the object's memory layout. By searching for cross references to CDecoder member variables (in offset range around the m_IsSolid variable 1c6d - 1c7c) we found offsets 1C6Fh, 1C79h, 1C7Ah, 1C7Bh to be unused. 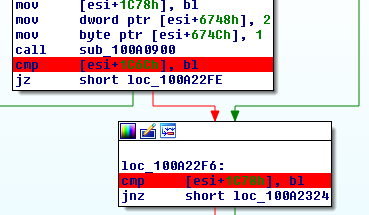 Based on this we selected and assigned the first one of the available offsets - 1C6Fh - to the new _errorMode variable. Patchlet 1: We micropatched offset 0x000a0388 (the CDecoder::CDecoder constructor) with code resembling line 195 of RarDecoder.h and line 98 of Rar3Decoder.cpp. Patchlets 2 and 3: We micropatched offsets 0x000a25bf and 0x000a25de with code resembling lines 845 and 848-849. 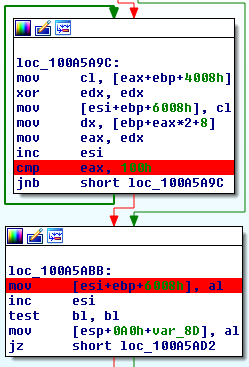 Patchlets 4 and 5: We micropatched offsets 0x000a22ee and 0x000a22f6 with code resembling changes to lines 929-930. 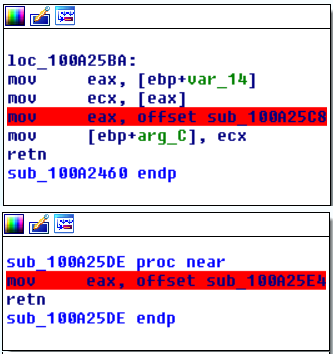 These two micropatches have already been published and distributed to all installed 0patch Agents. If you're using 32-bit 7-Zip version 16.04, you can download our free 0patch Agent, create a free 0patch account and register the agent to that account to immediately receive these micropatches and have them applied to your 7-Zip executable. If you're using some other version of 7-Zip and would like to have micropatches for it, please contact us at support@0patch.com.